THE LIFE AND WORK OF THE ARTIST EMILIO SCHERER CAN BE EXPERIENCED DURING YOUR TRIP TO BOSA AND THE OTHER TOWNS OF PLANARGIA. 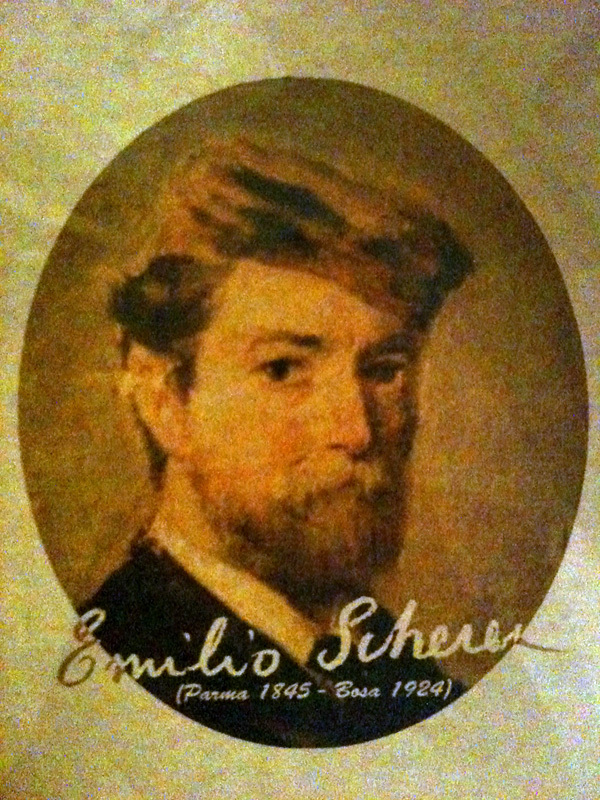 Emilio Scherer was born in Parma in 1845 and died in Bosa in 1924. He arrived in the town of Bosa, almost by accident, at a time when the cultural climate of Bosa was complex and extraordinary, and his work and personality became a central part of the city. Trained in Parma in 1872 he transfered to Napoli to learn from ‘the master’ Domenico Morelli, and it is from him that he became more interested in the genre of history, moving away from the romantic oriental impressions which were popular at the time, and which he developed further interest in during his subsequent stay in Tunisia in 1879. The presence of this famous painter in Bosa is reflected in the design of many monuments. His work in Sardinia dates back to 1875, when he created a painting for the Basilica of Cuglieri, and he later participated in the pictorial decoration of the Corrias-Carta Oristano Palace. He also contributed significantly to the work carried out in 1877 to the Cathedral of the Immaculate Conception (Cattedrale dell’Immacolata) which was greatly admired and appreciated by the town’s population. Another of his famous work is that of the decoration of the apse of Bosa Cathedral which depicts the apparition of the Immaculate and the patrons Emiolio and Priamo watching over the City. Among the various prints he recalls the dome of the Paridiso Dantesco, the luminous garden of the Saints, and many figures written about in the Old and New Testament. His work can also be seen in the Church of Santa Croce and in the Seminary. After his first episode of work in Bosa, he departed for Tunisia. The exotic feel and colony culture stimulated his pursuit of light and colour and provided a variety of new subjects and stimulus. He was forced to leave Tunisia and return to Bosa in 1887 due to the breakdown in relations with France and the subsequent conquest of the territory. The ‘maestro’ had by this time gained a very good reputation and embarked on the next, more mature, phase of his work, turning his hand to more large scale, architectural projects in Planargia and beyond (Cuglieri, Tresnuraghes, Boroughbridge, Seneghe). His work at this time redesigned the look of some of the most important buildings in Bosa, both secular (the Town Hall, Theatre) and religious (Cathedral of the Immaculate, Churches of Croce and Stella Maris), as well as various private residences. From 1888 to 1889 he was commissioned to do portraits and to work in the parish church of Tresnuraghes, in a town a few miles from Bosa. In 1890, he painted tow large murals for the side walls of the presbytery of Santa Maria del Mare in Bosa Marina, where the lighting effects reminiscent of Africa, become hot and dense. In 1893 he decorated the Church of St. Mary of the Snow in Cuglieri. Additionally it must be noted that included in his work on some of the most beautiful buildings in Bosa between the 19th and 20th centuries is that of the Maroni building, today known as the Palazzo Pischedda. Scherer, manipulated of images and colours in a way that had never been seen before and used his talents in Bosa in such a charming an exotic way that could only be introduced by a foreigner. Blonde and partisan, he used his experiences in Naples and North Africa, and was quickly associated with the Society for local workers and Mutual Aid (a highly political organisation). After his final return from Africa, he was surrounded by a narrow circle of intellectuals and the Parmese artist fully immersed himself in renewing the expansion of Bosa, coinciding with the aftermath of the Italian Unity. It was in this time that Bosa, partly due to his influences, became the historical city of Sardinia, and one of the many cities of Italy.